Matthew Harris Jouett was an American portrait painter. 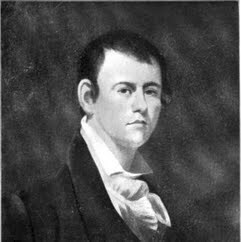 Jouett was the son of Sallie Robards and Jack Jouett, a hero of the American Revolution. The elder Jouett sent his son to Transylvania University and encouraged him to study law, but Matthew spent much of his time painting. The frustrated father commented "I sent Matthew to college to make a gentleman of him, and he has turned out to be nothing but a damned sign painter." Jouett served as a lieutenant of the 28th infantry in the War of 1812. He was promoted to captain. After the war, he studied portraiture and went to Boston to study with Gilbert Stuart in 1816. Jouett painted in New Orleans, Natchez, Mississippi, and Kentucky. He was commissioned by the Kentucky legislature to paint a portrait of the Marquis de Lafayette. Jouett also painted Thomas Jefferson. Jouett was the father of James Edward Jouett, a naval officer. James served with Admiral David Farragut and was immortalized in Farragut's famous quote "Damn the torpedoes! Four bells! Captain Drayton go ahead! Jouett full speed!" Matthew Jouett is buried in Cave Hill Cemetery.